- collapsible design is also good for storing when you are not using it. Basically it is built how you would expect for headphones under 20$. The collapsible design might seem convenient at first but, just after 3 days the whole thing feels kinda wobbly. I was actually surprised that they didn't sound horrible. Normally I wouldn't buy headphones under 30$ but, this pair seemed interesting because it was advertised as studio headphones. Plus it has a built in mic. Overall if you are strapped for money but need headphones these would be a decent pair to get. do you know where i can purchase a set of these headphones? I received them for Christmas and have had bad results. After only a day or two they started to go out in the left ear. I wouldn't recommend them myself. Also, for me, the microphone and the headset refuse to work at the same time. I can either have headphones without the mic, or a mic that won't work as headphones. @Pezlia i know what you mean it happened to mine after about a month of use, though i had no problems with the mic... that seemed to work like it should (when you get a phone call the music would fade out and etc...). Your pair could have been a defective pair from the start. My sister had a bad pair (out of the box she was getting now sound out of one of the speakers...) She just took it back and got another pair. I've been looking but cant find them anywhere... (out of stores anyways...) I've seen them in K-Mart and in Family Dollar. I'm having problems of my own. For some reason the mic does not want to get my vocals any one have any solutions??? I have been using the Emerson Studio Headphones for many months now at work. They are great headphones! They produce a full range of tones, you hear it all, what you would expect for “Studio Headphones”. I don’t have any equipment to measure the quality of the sound, but I can say they are enjoyable to use, even after hours of use. They are in the big leagues of high quality sound reproduction. You won’t find a lot of metal holding these together, but that’s an advantage, they are light and comfortable. They are foldable, great for carrying in your pocket. With the built in microphone, they work super with your smart phone. The price is an incredible low $7 at Family Dollar stores. The value of these phones thus is off the charts on the high side. The box says “amazing sound quality” , and you will agree after hooking them up to a high quality input. 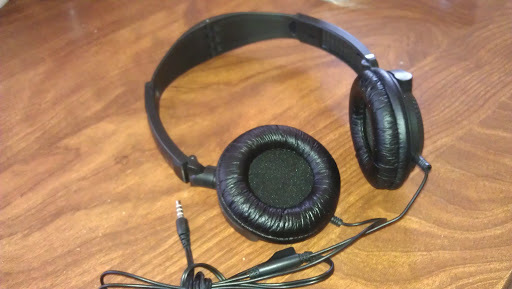 The bass reproduction is phenomenal; it handles those real low tones like few other headphones can. They are sensitive such that they will work fine on any phone or mp3 player with more enough volume.